Wrap yourself in wooded seclusion. The Smoky Mountains are calling. Relax in the hot tub after a day of exploring. Great mountain memories to be made at this mountainside getaway. High on a mountain and secluded in the trees, Harmony Hollow is the perfect spot to find tranquility in the Smokies. 2 Bedrooms and 2 Baths. The upstairs bedroom has a king bed and a bathroom. The main floor bedroom has two twins, which can be converted to a king for an additional charge. There is a full bath on the main floor. The cabin was very comfortable and perfect for a relaxing weekend. I have high standards for cleanliness, and my standards were definitely met. This was the nicest vacation rental we've stayed in! Even the hot tub seemed very clean. We thoroughly enjoyed our cabin stay!Everyone was nice and pleasant. We enjoyed a great vacation facilitated by a great cabin. We loved the fire pit and hot tub. We took the family on the Polar Express. We had a great 3 days here. Would like to stay longer. Enjoyed the quiet, the fall time of the year. Would come back anytime. The cabin was so beautiful and secluded. I would stay there again, everything exceeded my expectations and was extra clean! The staff was very friendly and very helpful. The area we stayed at was so beautiful. Also, the cabin makes you feel like home, cozy and inviting. I will make another reservation in the future. Bryson City is like my second hometown now. Visited Great Smokey Mountains, Cades Cove, Fontana, Waynesville to eat, and the Dragon Tail, which was an exciting ride with so many curves on the road. You have got to do it. This beautiful cabin was very enjoyable and secluded. My wife and I cannot wait to come back some day. Bryson City was close by and so were the attractions and sight seeing. Deer would come in to the yard every evening to eat acorns, what a lovely sight. We will be back again. Thank you so much. Love the remote yet easy to access cabin. Perfect for privacy and relaxation. Very nice surroundings. Easy drive to Bryson City and hiking in the Smokies, which is why we were in the area. Hard to leave the cabin and hot tub though! Cathy was very helpful. Listened to what type of property we were looking for and made a great recommendation. Not pushy at all. Great with location information and helping navigate the website. We had a relaxing and peaceful stay here! Just a quick weekend trip for our anniversary. Beautiful cabin! Thank you for the beautiful cabin and all its wonderful amenities and charm. We love it here, so do our two small children. We visited many waterfalls. Cades Cove is a must! !Amazing vacation. Everything was memorable! Great, private cabin. We had an enjoyable getaway for our 50th anniversary. We love, love Bryson City. This cabin was exactly what we needed. It's perfectly secluded but still close enough to town. We had a blast fishing, tubing in Deep Creek. We also went to Cades Cove and Gatlinburg. We went horseback riding through the mountains. This was the perfect hideaway! We thoroughly enjoyed our stay here. We went to Bryson City and shopped. Did a ton of sight seeing. Best place to watch the sunset is Water Knob Rock Overlook on Blue Ridge Parkway. Cades cove is amazing. Beautiful cabin...we will be back! It was a beautiful cabin with top of the line appliances. We thoroughly enjoyed the time we spent there. We would love to come back again!! We enjoyed our time just being in the cabin from cooking to peacefully rocking on the porch. It was landscaped beautifully and the scenery was amazing. The cabin had state of the art kitchen appliances, tv, and a nice gas grill. Having toiletries and nice fluffy towels was also a nice and inviting touch. The cabin offered us a hot tub and puzzles to work for entertainment. We had a wonderful time here at Harmony Hollow. The cabin had all the comforts of home and more. This cabin will definitely be in our future as we plan to return. We received a phone call the day of check in to ask whether we had found the cabin or needed anything. We had not yet arrived, but we appreciated this call. We also called the next day to get the WiFi password and the person with whom we spoke was very nice. ; The property far exceeded our expectations. It was spacious, clean, and well-appointed with everything you would need. The kitchen was amazing and so was the hot tub. The washer and dryer were also an unexpected and convenient touch. The cabin was beautiful and very homey. Exactly what we were expecting and allowed us to have a magical weekend away. We loved the king size bed, the hot tub, and the grill, the fire pit was nice too. We enjoyed hiking, horseback riding, the cinema. Cabin was wonderful! Secluded but convenient. We came for our annual Polar Express train ride! We had a wonderful stay. Our family came for the Polar Express train ride. We will definitely come back and stay here next year. Thank you for having such a great property. Great updated space, very clean and relaxing ambiance! Perfect getaway from the hustle and bustle of the busy routine of life! Thanks a lot for making sure we had everything we needed for our weekend at the cabin! Its a fun and relaxing experience, we loved the space and we will surely recommend this place to our friends! The cabins was exceptionally clean inside and out. We loved the living room with the great view. 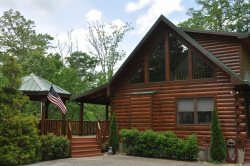 This cabins is conveniently located, secluded and had everything we needed.